Gerald Hüther pictures the change from the Ideology of the Lone Fighter towards the Expansion of Potental, where human beings are not „treated as objects“, but „identfed as subjects“. 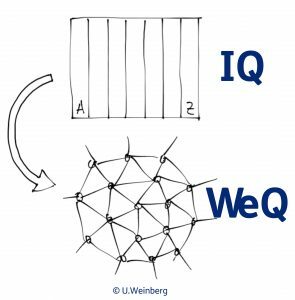 Helga Breuninger and Wilfried Schley regard the WeQ Modus as response to the increasing complexity that overstrains every single person. Thereby, solutons are developed co-creatvely and designed together. Both the willingness to partcipate and the dispositon to share grow in contacts and relatonships with each other.